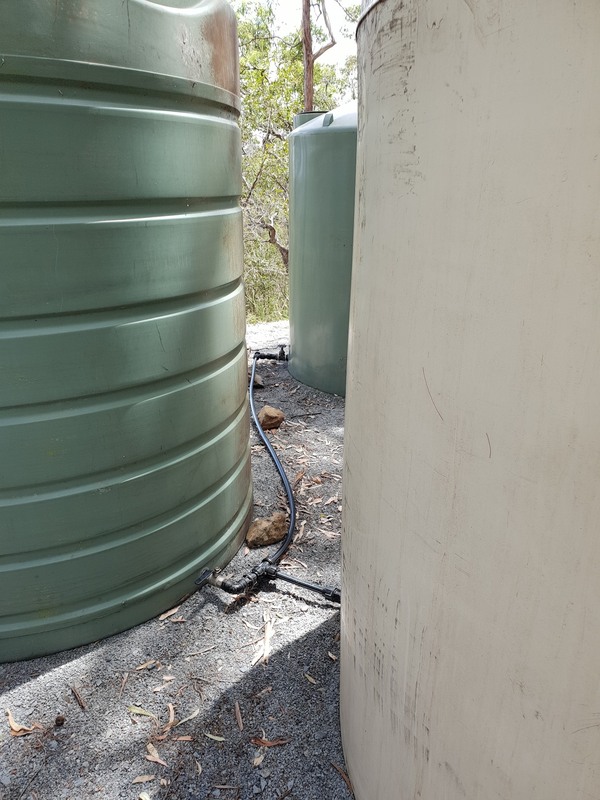 I’d thought about a few ways to connect the tanks to make sure we had solid connections, good flow and water security, but in the end the simplest answer was the best. Connect the three tanks with 25 mm Blueline and run it around to the pump. I was trying to engineer the tanks connections to pump with 50mm poly pipe, with the expectation that greater flow would be better for the pump. But it just got too expensive and complicataed. 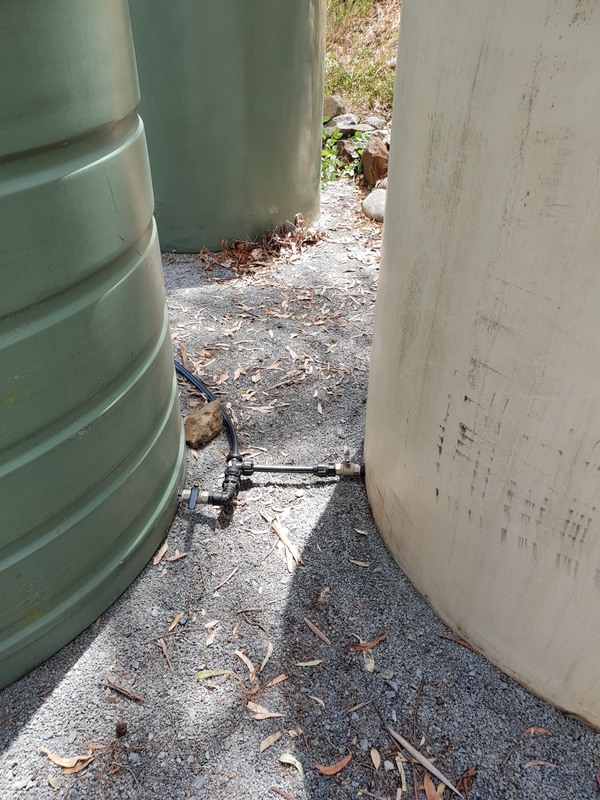 Two of the tanks only have 25mm outlets as well, so the outflow would have been restricted by that 25 mm outlet no matter what pipe I attached outside. Each tank has it’s own shut-off valve – these came with each of the tanks. So isolating one tank or more was not going to be a problem. 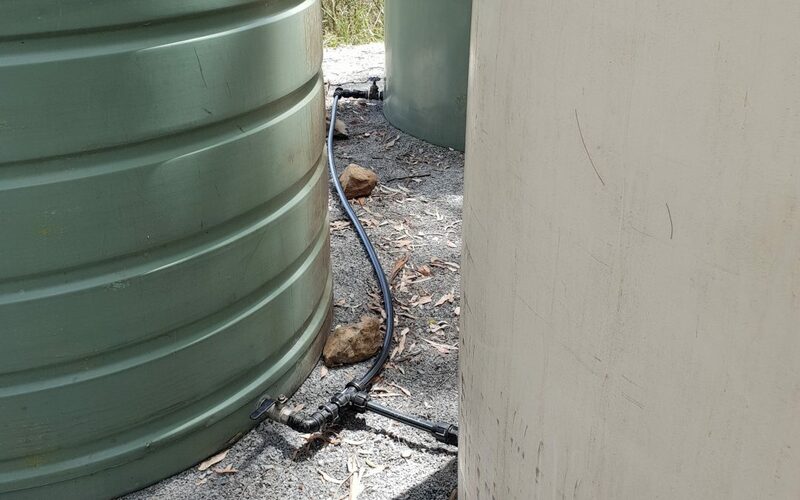 I added a further shutoff valve on the pump side so that we can start collecting water straight away. 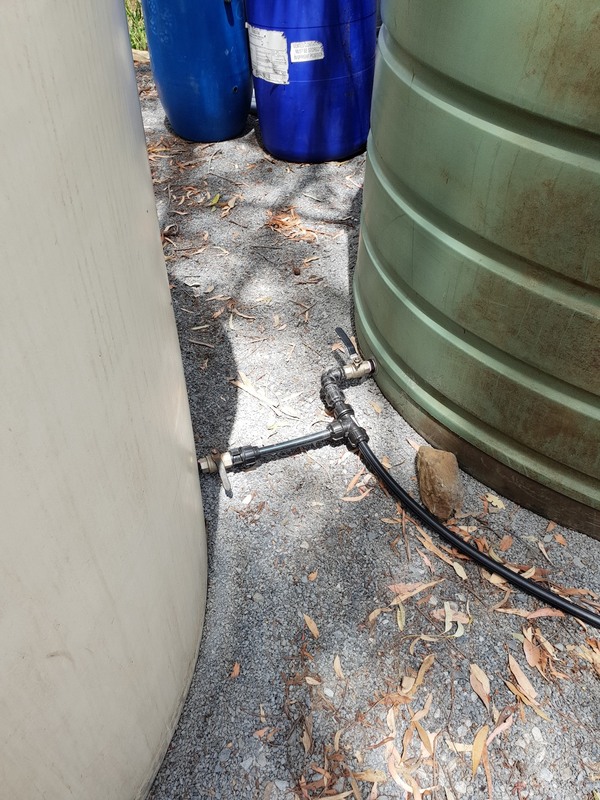 The basic plumbing and fittings for this was quite simple and we got to reuse some of the connections that we have picked up and collected over recent times. The fittings may be older, but they are intact and functioning and re-using stuff is always one of our highest priorities. The piping will continue round to the north side of the tank pad, where the pump and solar setup will be. The pump is all set up and ready to go, but the solar system will take a little while to get built and put together. The roof should be on the container office within a month or so, and we should then be able to collect water at the nursery. Right now we are ‘trucking’ water in 1000 litres at a time. We are now another step closer to the Nursery being fully functional. The shade house should be up before the end of February and at that time water will become a required resource, so the solar setup will be the next element we will complete.